Even though we cannot see ultraviolet radiation (UV), it can damage our eyes. Two kinds of UV radiation affecting our eyes. are UV-B and UV-A. Type B ultraviolet radiation is in the wavelengths 280 to 314 nanometers. Thought the earth’s ozone layer helps protect us from it, with the degradation of that layer because of environmental factors, we are exposed to more UV-B than ever before. UV-A has wavelengths ranging from 315 to 399 nanometers and is not absorbed by the ozone layer. Whether we are exposed to direct UV radiation that’s sunlight or artificial light (tanning beds, lasers, welding machinery), UV radiation can harm our eyes. Indirect UV exposure comes from reflections off beach sand, snow, pavements and other surfaces. These reflections may burn the outside surface of our eyes, which is a temporary condition. Long-term exposure to UV-B radiation may cause cataracts, which cloud the lens of the eye and may cause blurred vision. The American Optometric Association defines long-term exposure as small amounts of UV exposure over many years. Long-term exposure to UV-B radiation may also cause pteryglum, which is a growth over either the cornea or the corner of the eye. Though this condition is usually not cancerous, it affects vision and surgery may be necessary to improve vision. Exposure to UV-B radiation may also cause macular degeneration (which affects the macular part of the retina) and skin cancer around the eyelids. UV radiation may also cause snow blindness, a condition that burns the cornea. It is usually a temporary condition. 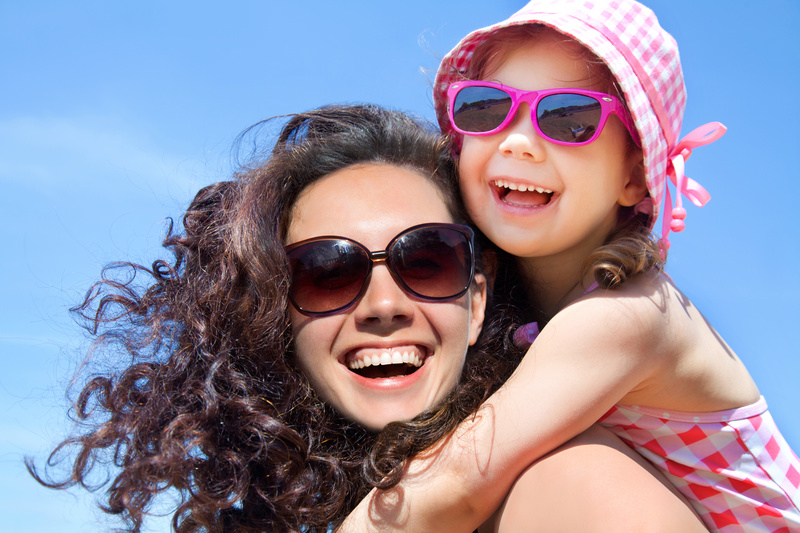 Sunglasses offer protections against eye damage from UV radiation. If we work and play in the sun and water at Monterey State Beach, Del Monte Beach, San Carlos Beach or any beach, we should wear sunglasses. The Environmental Protection Agency (EPA) recommends wearing sunglasses every day. Winter sun is lower in the sky and, therefore, more directly in our faces than summer sun. We should be careful on cloudy days too because ultraviolet light penetrates haze. If we have had cataracts removed, take birth control pills, water pills, tetracycline or sulfa medications, we are at higher risk of eye damage from UV rays. When buying protective sunglasses, we should look for a label that says that the glasses protect against 99 percent to 100 percent of UV-A and UV-B. If the label says “UV absorption up to 400nm” this is the same as blocking 100 percent of UV radiation. Research shows UV rays can enter around regular eyeglass frames. That’s why wraparound sunglasses provide added protection for the eyes because they block UV radiation from the side and overhead. Since damage to eyes is cumulative, we should start wearing eyeglasses early. The Environmental Protection Agency suggests that children and adults wear sunglasses daily. Teenagers and people in their 20s who spend a lot of time outdoors are sometimes diagnosed with pteryglum. While most of us choose sunglasses with dark lenses, the tint is less important than the necessity that the lens have a UV coating. We should talk to our ophthalmologist or optometrist about what tint is most suitable for our activities.